During several years when I worked for a nursery as a plant seller, the question I heard most often was, “What’s a good groundcover?” My invariable reply was, “What sort of ground do you want to cover?” Fortunately, my customers were good humored and allowed me time to explain my response. Matching plant to place is always important, and it is especially true when selecting groundcovers. In addition to the usual questions about site conditions—sun or shade, moist or dry—recommending a suitable groundcover requires learning much more about the planting area. Will there be foot traffic. Is runoff or erosion a consideration? What other plants, if any, will share space with the groundcover? Mat-forming groundcovers, especially those that are evergreen, can be used as underplanting for trees, shrubs, and most bulbs, but they may be too vigorous to combine with other perennials. Southeastern native plant communities include many examples of plants with complementary root systems and growth habits that enable them to grow together while out competing intruders. 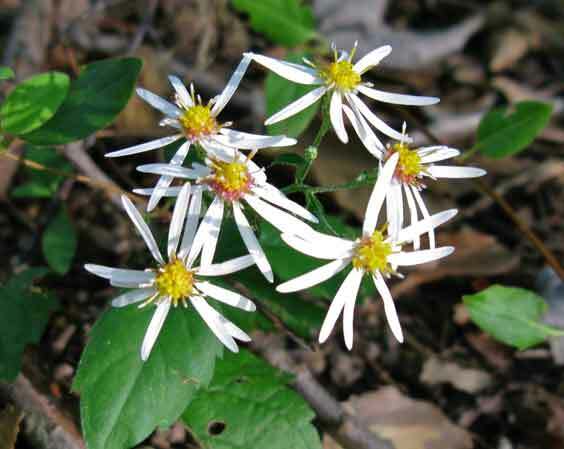 White wood aster (Eurybia divaricata) is a vigorous spreader for part to full shade. The low-growing, dark green foliage is topped mid-summer to fall with airy white flowers. Although wood aster could out compete other summer-flowering plants, it is a perfect companion for spring ephemerals, which come up in late winter and go dormant soon after the aster emerges. Groundcovers that are too dense to combine with same season perennials may be perfect for areas where very little else can or will grow. Woodland stonecrop (Sedum ternatum) grows in extremely thin and rocky soil where it forms an evergreen, deer-resistant groundcover adorned with white flowers in late spring. One of the ironies of gardening is that the more we improve circumstances for desirable plants by amending the soil or irrigating, the more we create opportunities for undesirable plants, aka weeds, to invade. Groundcovers that can establish and thrive without extensive soil preparation will be more effective at limiting weedy invasion. 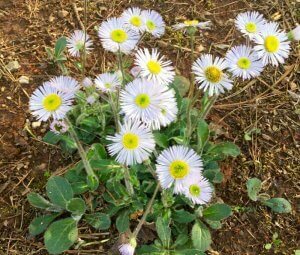 Robin’s plantain (Erigeron pulchellus) thrives in our typical clay soils. The fuzzy gray-green deer-resistant foliage is topped with daisy-like flowers from late spring to early summer. Another low profile, deer resistant plant, pussytoes (Antennaria plantaginifolia), does double duty as a dry shade groundcover and host plant for American painted lady butterflies. Pussytoes thrives in rough areas, but reseeds too vigorously for use in cultivated parts of the garden. One of the most versatile, as well as most charming, native groundcovers is green and gold (Chrysogonum virginianum). This low-growing evergreen has bright golden flowers from late winter through spring. Green and gold has long been a garden favorite, so many selections and cultivars are available. ‘Pierre’ is a clumping variety with a long bloom period, while ‘Eco-Lacquered Spider’ is a vigorous, mat-forming spreader. Clumping forms are excellent companions for other shade-loving perennials while ‘Eco-Lacquered Spider’ does a good job of suppressing weeds in a sunnier site. We often think of low-growing plants when searching for groundcovers, but in areas without foot traffic, an array of more upright, ornamental plants can be used. 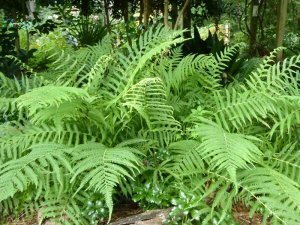 Many native ferns make excellent groundcovers. 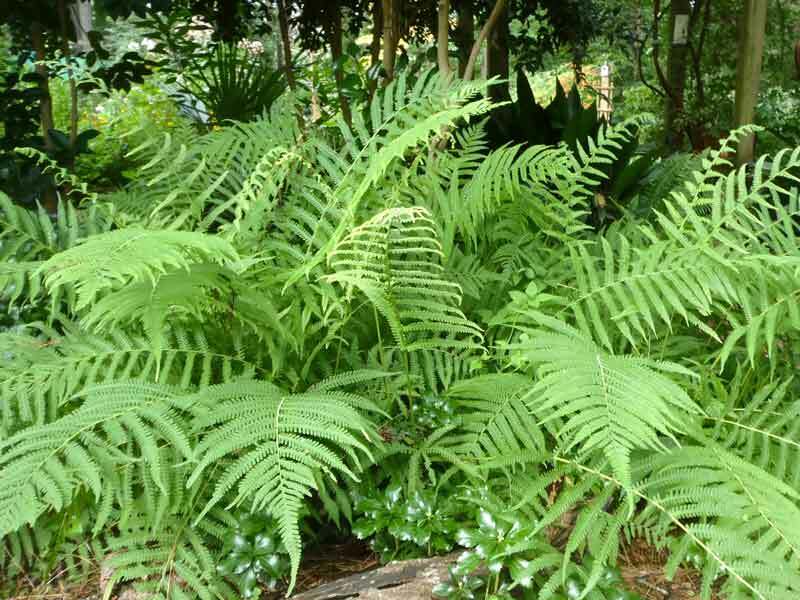 One of my favorites, southern shield fern (Thelypteris kunthii) forms a graceful colony of arching pale-green fronds that brighten shady areas throughout the growing season then turn a beautiful bronze before going dormant for winter. It will also withstand sun in moist areas. Another upright groundcover, yellowroot (Xanthorhiza simplicissima), is actually a compact deciduous shrub. Often found growing along stream banks in the wild, yellowroot is an excellent choice for wet spots or stabilizing erosion. In my garden it has also succeeded on a dry slope shaded by an evergreen magnolia. The best groundcovers thrive without irrigation or fertilizing and want little care beyond an annual tidying. Flowering groundcovers will look neater if the bloom stalks are removed when the flowers are spent and others such as ferns or coral bells may need a late winter clean up. Cutting back trailing and creeping phlox (Phlox nivalis and P. subulata) after flowering promotes denser growth. I maintain creeping phlox planted on my road frontage with an annual once-over with the lawn mower. Groundcovers can do a lot to lower maintenance chores, including serving as “living mulch” by suppressing weeds and retaining soil moisture. Native groundcovers enhance our gardens in other ways as well. They provide nectar and serve as host plants for pollinators, produce seeds and fruits for birds, and they create beauty and diversity for the gardener to enjoy. 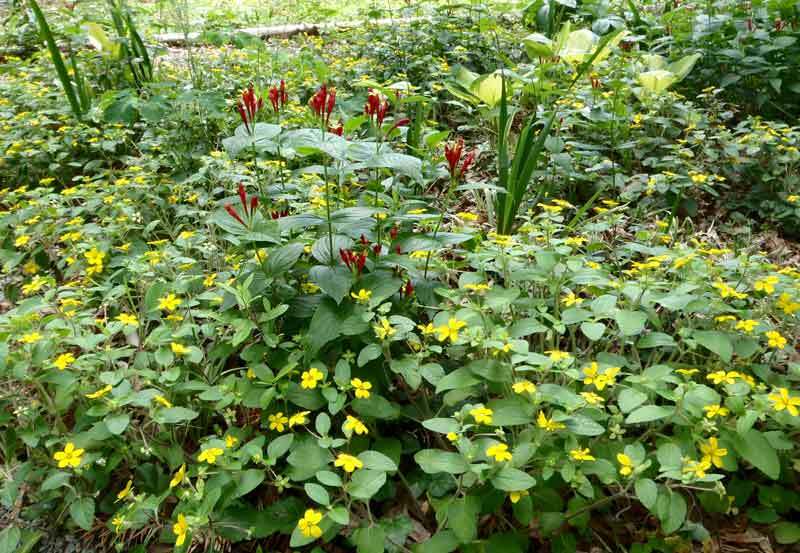 Click here for an extensive list of native groundcovers, including details on where to plant these in your garden. Dale Batchelor owns Gardener by Nature LLC, a residential design and consultation company in Raleigh emphasizing sustainable landscapes and native plants. With her husband, John Thomas, she co-created Swiftbrook Gardens, a habitat certified by the N.C. Native Plant Society and the National Wildlife Federation.